One of the strangest incidents of the season got stranger still yesterday when Gavin Gunning was told he was welcome back at Dundee United, a day after a statement from the club confirming the defender had left “by mutual consent”. It doesn’t rain but it pours for Mixu Paatelainen. As well as dealing with the update to the bizarre Gunning situation he had also to face up to being without a second first-team player for this weekend’s Scottish Cup semi-final against Hibernian. While Gunning is now free to come back and train at the club, he won’t be picked again this season. More damaging to the club’s hopes of reaching a Scottish Cup final and avoiding relegation is the news Paul Paton is a major doubt for this weekend’s clash with Hibs, after a recurrence of a knee injury. There are also fears he could miss the rest of the season and, perhaps, Northern Ireland’s Euro 2016 finals campaign in France this summer. 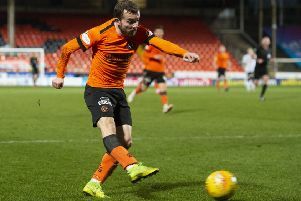 But while Paton’s misfortune is a potential personal disaster for the player and a significant blow for his club, it is Gunning’s circumstances that dominated the agenda at the Tannadice club’s training base in St Andrews yesterday. Paatelainen even chose to host an unscheduled press conference to deal with the latest developments in a situation that began to unfold in the second half of United’s home league clash with Inverness Caledonian Thistle on Saturday. Having received a pass from Paton, Gunning bent down and picked up the ball to the bafflement of everyone in the stadium, including his own team-mates. He then strode off the park with the ball in his hands before returning to the pitch, and collapsing to the turf, where he received treatment for what Paatelainen described as a knock to his knee. While Paatelainen would not go into the reasons for making his decision to exile Gunning, it seems the player’s sarcastic applauding of the furious home fans as he left the field to go to the dressing room after being substituted sealed his fate. “It is a very unfortunate situation,” said the Finn. “Things went on and obviously it is something we could not tolerate so I took the decision and told Gavin he would not play for us again. I also said to him if he wished he does not need to stay here. That’s where we are. Amid reports that Gunning is refusing to leave quietly Paatelainen did confirm that the defender is free to return to train, if he so desires. Otherwise he is free to enjoy “an early summer holiday”. The club will continue to pay the player’s wages for the remainder of his contract, which expires this summer. The 25 year-old has made 20 appearances in his second spell at United, since re-signing in November.